After an afternoon in a field, hanging out under the trees with a horse I haven’t seen in a year, I’m gratified and grateful today. Gratified that spending time building a relationship can make such a difference in a horse’s life and grateful that I was chosen and trusted by this criollo (grade) mountain pony. 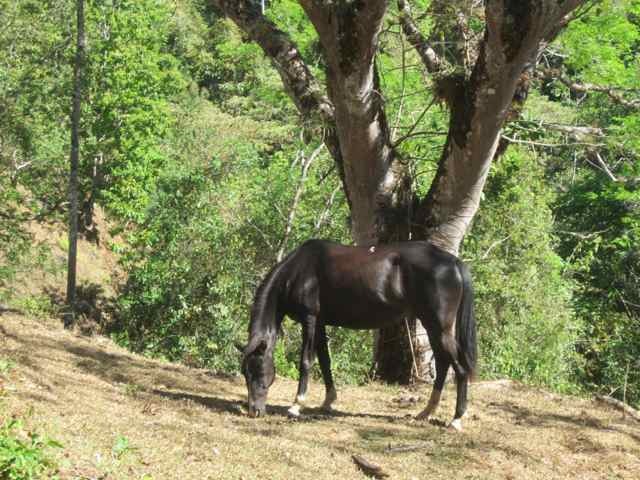 When I first met Princesa (Princess) at Finca Las Alturas over 3 years ago she was shy, lacked confidence, distrusted humans, and was quick to shut down when faced with pressure or uncertainty. This time, not only did my special friend remember me, she greeted me with a resounding whinny. I’d gone down into one of the pastures looking for the horses and not far down the lane saw them in the next pasture over. “Princesa! How is my lovely?” I called out. She answered immediately and rushed to meet me at the gate. In those early days Princesa hung back on the fringes of the herd, always the last to approach, wary of humans approaching, and becoming tense when touched. 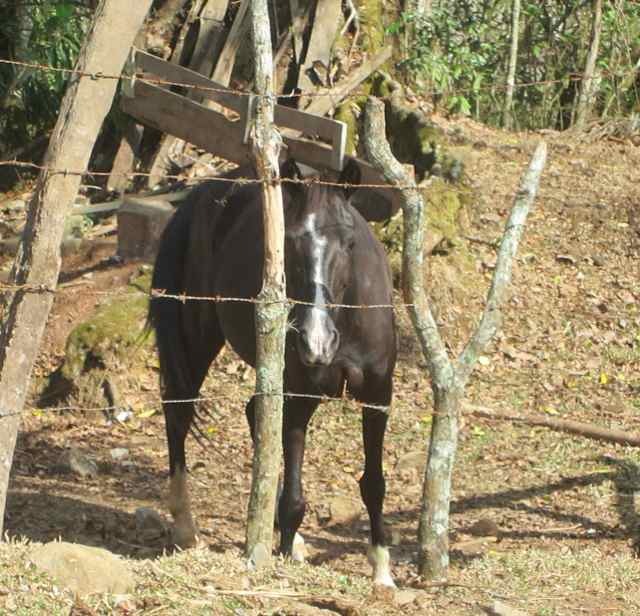 I watched her on the perimeter while other horses walked straight up to me, curious and secure, and silently promised her I wouldn’t touch her until she touched me first. 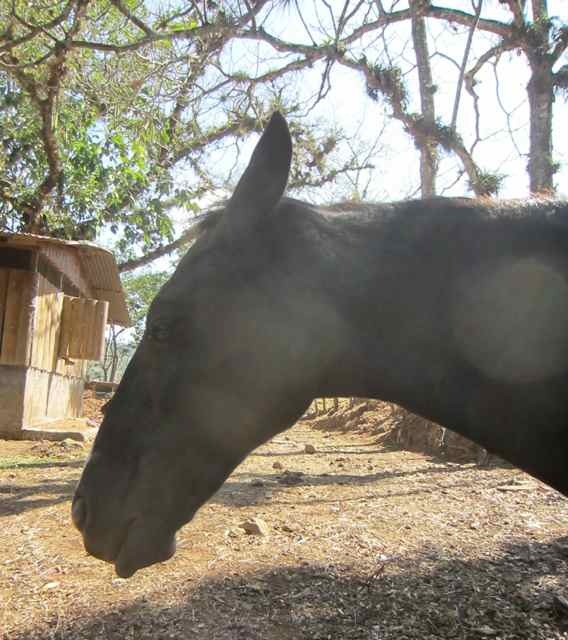 On a large property, there is lots of space to leave if they want to, so seeing horses as sociable and people-friendly as the Las Alturas herd was and is a credit to Patsy’s ongoing commitment to being in relationship with her horses. And still this one held back. One warm sunny afternoon a couple of days after we met I found Princesa standing in the shade at the tack up area and joined her there, dropping my arms to rest them on the hitching rail across from her and cocking a leg in a posture of equine relaxation. In no time Princesa was nodding off and there we rested in companionable silence for quite some time. And not once did I touch her. The breakthrough came just a few days later. Patsy and I had taken the horses down to an open area on the property to do some ground work. When Patsy finished working with Princesa she let her loose. Princesa walked up behind me and bumped me with her nose. “She touched me!” I silently exclaimed. Not wanting to rush things, I turned and slowly walked a few paces away feeling exhilarated that she had reached out to me. Then I felt it again. Bump! She’d followed me, nudging me harder this time. I can’t tell you how gratifying it was to have let her make the first move and know she was choosing to be with me despite her general feeling towards humans. Thrilled, I began massaging her back, starting at her withers and working my way down her back. After what was at least half an hour she hadn’t moved a muscle. Was she enjoying it, or had she simply shut down? I didn’t dare try anything that might risk our delicate, budding relationship. I stopped, checking in with her body language, and felt an almost imperceptible movement as she shifted her weight ever so slightly toward me, a subtle “please don’t stop” request. 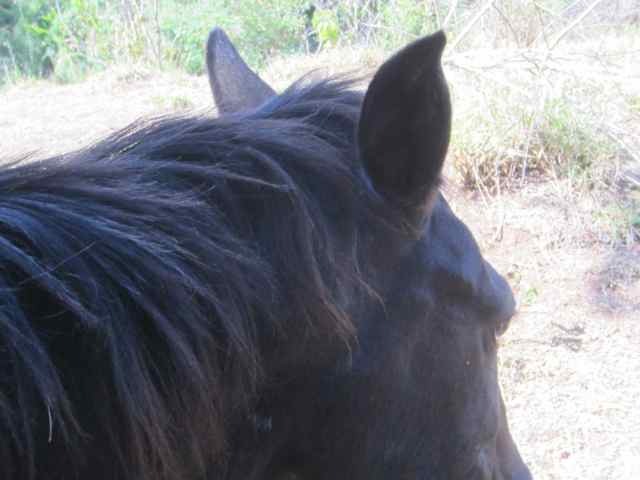 That day, out in the open with no fence to keep her nearby, I was gifted with an amazing experience, the reward for meeting a shy, wary mare on her own terms. Today, together again in that pasture, I was full of memories. Princesa and I have a relationship built on a foundation of many subsequent Spa Days, ground work sessions, and many hours spent together in companionable silence. I’m not the only one who has loved her and shown her that humans can be relied upon, and I’m very glad of that. Thanks to many loving hands and hearts, she has continued to flourish, gaining confidence and trust. For all of her wonderful transformation, Princesa remains the master of understatement and subtle cues, not given to public displays of affection. So I can’t help feeling there’s something special between us that she would come to me and stay with me when the rest of her herd has wandered out of sight, shifting ever-slightly closer until her neck is resting gently against me as we relax together in the shade. Originally posted at Finca Las Alturas, March 2014.